If there is one thing New Orleans likes more than controversy—and even baseball–it’s a social media war. This time it’s not the kale lady, the Disney gumbo video (an abomination), or even that New York travel writer (#besafe). But, yes, the yanks are at it again, literally. The New York Yankees’ minor league baseball affiliate are attacking our team’s king cake baby on several fronts. 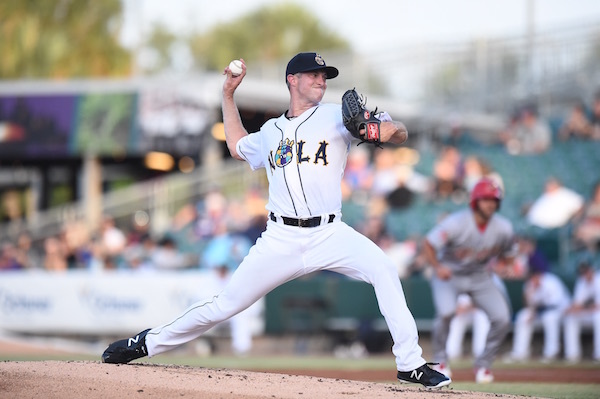 The Scranton Baby Bombers, to put it delicately, are battling our New Orleans Baby Cakes. Not all of it is nice, not at all. Sporting and not-so-sporting New Orleanians are up in arms. Why? Because we love to be up in arms about outsiders stepping on our toes, borrowing our culture, and we like to express our outrage in unison, that’s why. The dirty details for the win: Locals are posting #TeamBabyCakes online as often as possible until midnight of July 29th. The team with the most hashtags wins. Locals are currently posting on Facebook, Twitter, and/or Instagram. To participate, simple type #TeamBabyCakes at the end of anything and everything you post on Twitter, Facebook, or Instagram no matter the post’s topic. At press time we’re slightly ahead, but not by much. You can also gently inform certain small-town Pennsylvania fans of what you think of their attempts at king cake baby cultural misappropriation; however, I’m not endorsing that type of behavior. Long before the Saints, New Orleans was originally a baseball fan town and our baseball team was the Pelicans. The Pelicans played for the Southern Association from 1887-1961. The team’s well known and primary home was Pelican Stadium on the corner of Carrollton and Tulane, located across from The Home Plate Inn. A local bar and diner so close to home, your lunch was free if the ball landed on your plate, according to local lore. Sports Trivia: Black Sox’s Shoeless Joe Jackson played for New Orleans in 1910. My family was also season ticket holders of the 1970s short-lived revival of the Pelicans. The team played at the Superdome minus the dirt, bleachers, sunlight, and mosquitos. They didn’t last long. I never could stand indoor baseball. It just seems un-American. 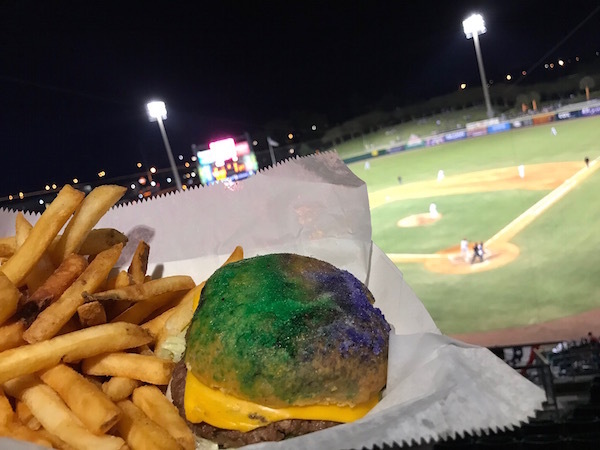 New Orleans acquired the Baby Cakes—a Triple-A affiliate of the Miami Marlins—in 1993, and filled a long-missed baseball gap for fans and in the city’s history. The team was initially called the Zephyrs, the Denver Zephyrs. Despite local confusion, the name was never an homage to the rickety rollercoaster at Pontchartrain Beach. 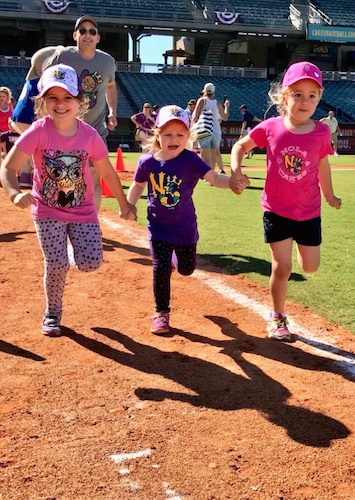 Emma Mae, Helen, and Chloe at the Shrine on Airline participating in the children’s run for the bases. Name providence aside, the team was an instant summer draw. Albeit, the 2016 name change to Baby Cakes and accompanying king cake baby logo may have proven controversial at its launch (locals do not like change), but it’s here to stay. “The name has been proven wildly popular, and the Baby Cakes merchandise is a heavy seller,” said Cookie Rojas, Baby Cakes general manager. The current franchise is kid-friendly to the extreme, but still just as magical for adults (if you love baseball). 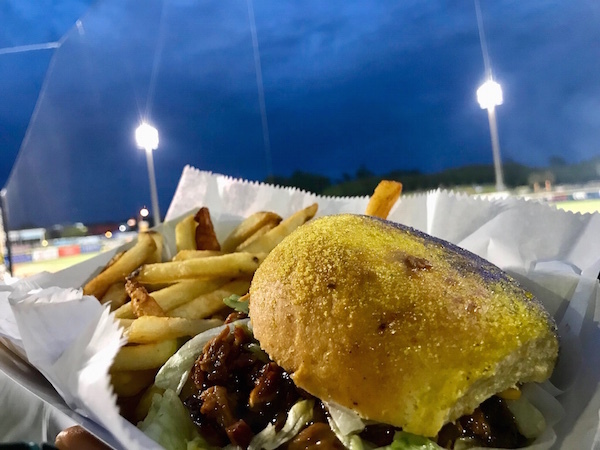 For the kids, there’s popcorn in a baseball hat, pizza and ice cream, games, play parks, mascot races, 7th inning stretch audience competitions, field performances, fireworks, and numerous theme nights. 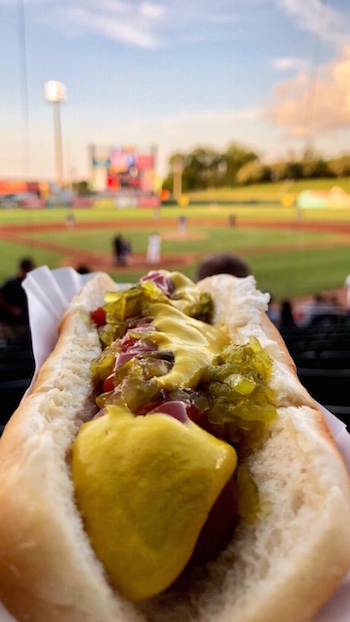 Purists and adults can still count on a good game, good hotdogs and cold beer. However, being that it’s New Orleans (and not Scranton), the stadium also sells snoballs, roast beef poboys, frozen daiquiris, jambalaya, a thick brisket grilled cheese sandwich, some kind of wonderful chicken fried steak with gravy, chicken strip and waffle nachos, funnel cake with sliced hot apples, Frito pie, and the famous Baby Cakes cream cheese and onion jam Burger served on a brioche bun glazed with Mardi Gras colored purple, green, and gold sugar. The social media competition has now been labeled the “Battle of the Bambinos” (a little too New York for my taste). The loser of the hashtag war must donate $2500 to the charity of the opposing team – in the Baby Cakes’ case the recipient is the Junior League of New Orleans. 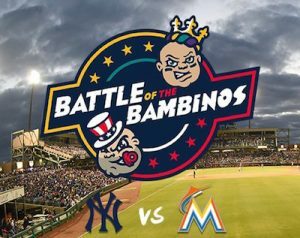 Additionally, one “Cakes’ fan who posts #teambabycakes will win a trip to Miami in August to watch the Marlins take on the New York Yankees in a match-up of the Baby Cakes’ and parent clubs,” per the team’s website. NOLA social media is an entity unto itself, a close-knit family of Southern eccentrics and characters like no other. We love hard, eat well, argue to the death over gumbo, defend our own, and stick together. Does anyone really think Scranton, PA believes they can take on NOLA social media and win? I’m not sure, but I’d hate to see it. So, there we have it: Scranton social media users versus New Orleans. It’s our baseball team and our old bald snarly king cake baby. I’m off to post my hashtags… for the love of the game… and cuz’ Scranton can line drive where the sun don’t shine. * The Baby Cakes are hosting diaper drives on July 25, 28 & 29 to collect supplies for the Junior League of New Orleans. Any group who donates 600 diapers will be awarded a private hospitality suite for 20 people to be used at a future game. Baby Cakes ticket prices range from $5 to sit on the grass levee to $12 for seats. The Shrine on Airline or Baby Cakes’ baseball stadium is located on Airline Highway in Metairie. Parking is $5. 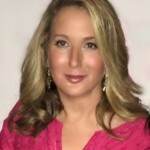 Kristine Froeba is a fourth generation Uptown girl whose varied background includes food and travel writing, celebrity ghost writing, public relations, social media management, fundraising, preservationist, reluctant tabloid hack, and litigation specialist. She describes herself as part foodie, part writer, part historian, historic renovation zealot, and full time dabbler.